The USA Super Bowl was played a few hours back (Congratulations Giants fans). It was also a record day for Twitter. During Madonna’s half-time performance Twitter averaged 8,000 Tweets per second – and a high of 10,245 during one second of her performance. The close of the game saw a new world record of 12,233 Tweets per second. That’s a 300% increase on the game last year when an earlier record was set of 4,064 Tweets per second. And those not keen on the sport still watched their televisions. Super Bowl is the time when major brands unveil groundbreaking advertisements. Smart Company offered a “first glimpse” into the big dollar ads. In an election year, politicians used local advertising time on offer to insert their own ads. And one from Michigan is already causing a backlash. Apparently, A democrat representative and a Chinese lady who speaks stereotypical broken “Engrish” are to blame for America’s money problems. 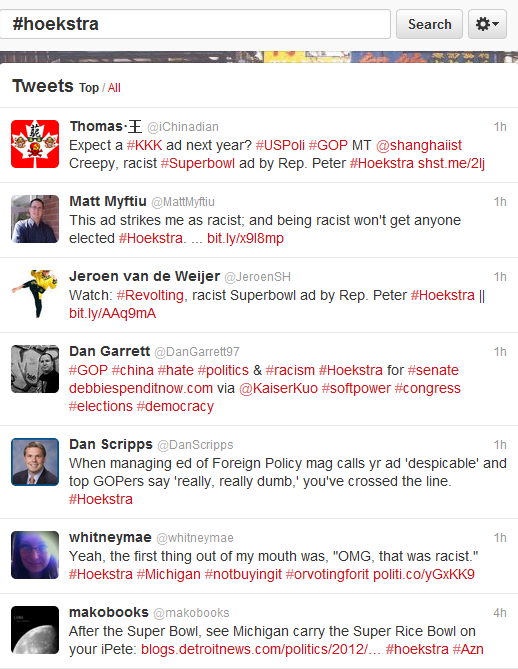 This ad…is completely out of character for Hoekstra. Where did Hoekstra find an untouched rice field and a young girl still willing to ride a bicycle in China? ← He’s a locust! She’s a locust! Wouldn’t you like to be a locust too?